I hope you have been enjoying September so far. The cooler temperatures and drizzly days have meant that I've been down on the causeway a lot less frequently than I was in the summer months. My plan is to set up at the Harbour until the end of September (weather permitting), usually between 11 am and 5 pm. I might go down during the first few weekends in October as well, but the weather seems to have other things in store for me! I'm pleased to announce that I will be displaying my artwork once again at the Village Café on Estevan Avenue in Oak Bay (just up from Willows Beach: 2518 Estevan Avenue). 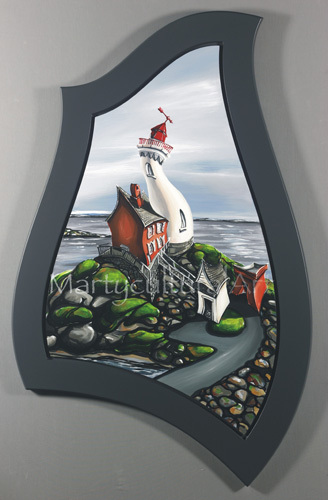 My show will be on the walls in October and November and will feature a number of new paintings that some of you have seen me working on down at the Harbour-- a sea plane, the Oak Bay Fire Hall, the Coach House of the Glenlyon Norfolk School, and the Fisgard Lighthouse 150th Anniversary painting. I will also have several framed posters and prints available for sale, just in time for some early holiday shopping! PS: For those of you who are interested in purchasing 12" x 16" posters but are not able to make it down to my booth at the Harbour before I close up for the season, there will be a supply of my images available for purchase at Artbox in Victoria. 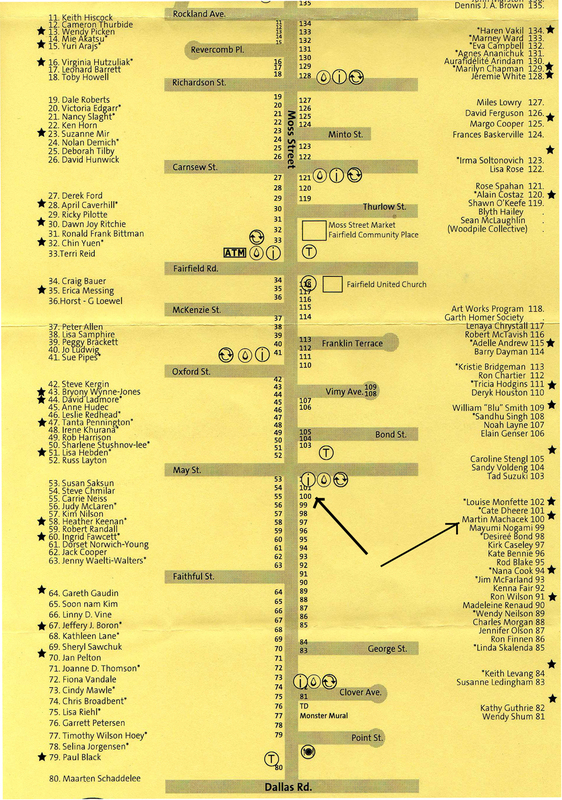 Artbox is located on the corner of Douglas Street and Bay Street, and it is open regular business hours during the week. Unframed posters from Artbox will be $20 each plus HST. Thank you! It has been an incredibly busy and rewarding August for me. I spent a lot of time down on the causeway here in Victoria, and I am amazed at the wonderful connections I made with people from all over the world! Once again, the autumn season ahead of me will keep me occupied with custom paintings and a few other anniversary paintings I have in the works. 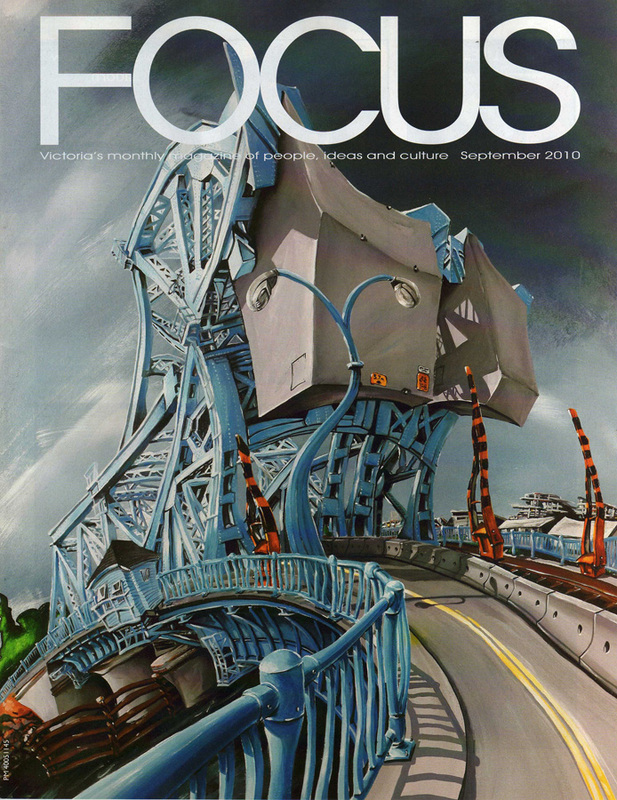 On top of all of this, I am thrilled to announce that my painting of the Johnson Street Bridge has been featured on the September 2010 cover of Focus Magazine! On November 12th, there will be an art event in Fan Tan Alley that will solely feature 'Blue Bridge' artwork. I, of course, will be displaying my piece of the Bridge there and am excited to see what other sorts of pieces will be showcased! The article in this month's Focus magazine (click here for a pdf version) highlighted linoprints on paper by Nic Vandergugten, and I imagine that there will also be some stunning photography at the show. I will post more information about the event as soon as it becomes available. Free print copies of the magazine can be picked up at various locations in the Greater Victoria region, or a pdf of the whole magazine can be downloaded from Focus Magazine online. Thank you for your support! Join Martycultural Art at the Sixth Annual Bowker Creek Brush Up! Summer has been clipping along at a speedy pace-- it's hard to believe it is August already! I wanted to let you know that I will be participating once again in the annual Bowker Creek Brush Up event, which will take place this year on Sunday, August 8th from 11 am to 4:30 pm. As usual, I will be stationed at Booth #2 for the day, located beside Ted Harrison just off of Hampshire Road in Oak Bay. 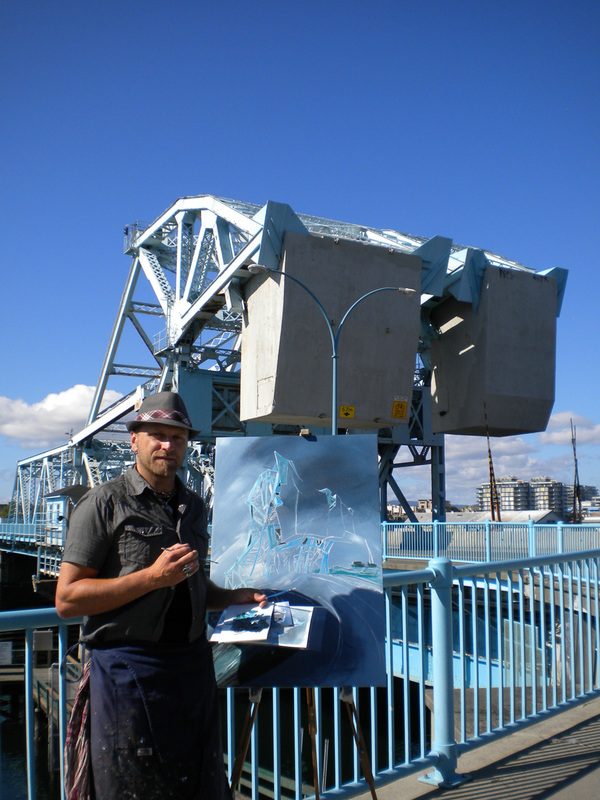 I am still deciding which painting to work on as a demo, but I'm pretty confident that I will be able to display the completed Johnson Street Bridge painting at the event. 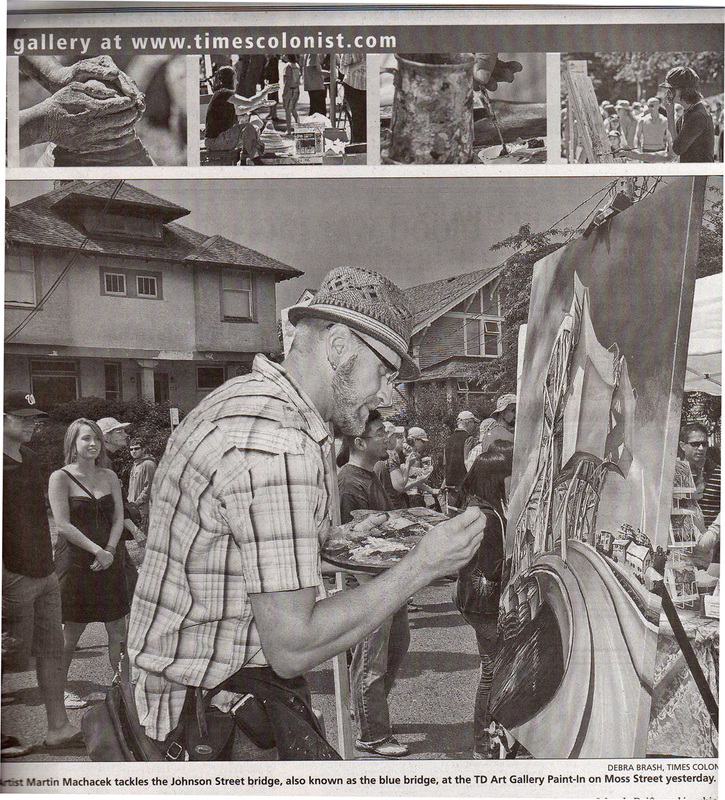 Quite a lot of detail has been added since I was photographed by the Times Colonist painting it at the Moss Street Paint-In! 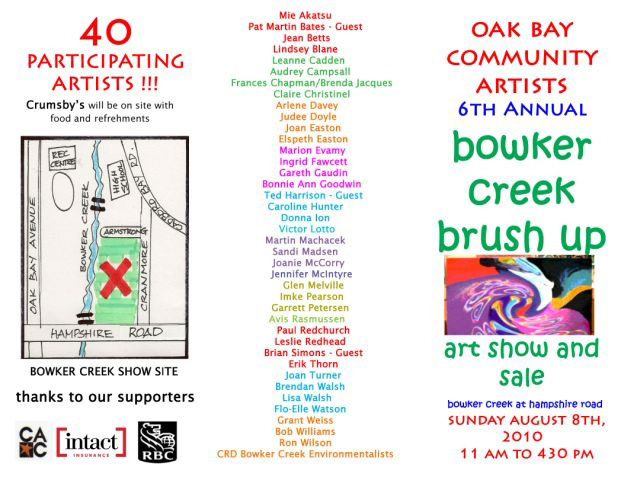 I hope to see some of you at Bowker Creek this Sunday! Wow! This year's Moss Street Paint-In was fantastic, and I felt honoured to be a part of this great event once again! Originally, I had planned to be working on a painting of the Craigdarroch Castle for the day, but I ended up working on a piece I already have in progress: the Johnson Street Bridge. 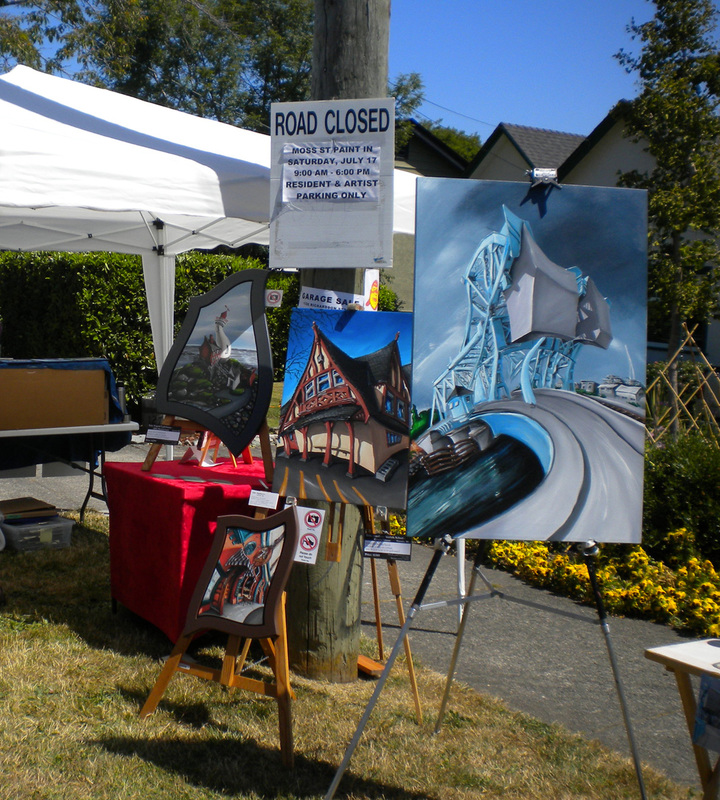 Paintings on display at the 2010 Moss Street Paint In (from left to right): "Fisgard Lighthouse- 150th Anniversary"; "Pagliacci's" (limited edition giclee); "Glenlyon Norfolk School- Coach House", and "Johnson Street Bridge" (in progress). All images and artwork copyright 2010 by Martin Machacek. Some of you will remember that I started this painting nearly a year ago, for the Local Colour 2009 event. However, due to multiple commissioned pieces that I was working on during autumn and winter, the painting sat untouched for many months, until very recently. I like to think of the Johnson Street Bridge as the Eiffel Tower of Victoria. People seem to be very divided on the aesthetic appeal of the bridge (among other issues), but its position as a local landmark cannot be denied. Resuming my painting of the Blue Bridge now feels very timely-- especially with the fate of the bridge still uncertain. I am amazed at what a conversation piece the painting has become already, even though it has not been completed yet. I received incredible feedback during the Paint-In yesterday, and the photo that was featured in today's Times Colonist newspaper has generated even more interest in the piece. As an artist, I am obviously passionate about all of the paintings I create, but I find that I am particularly enamoured with the Johnson Street Bridge painting. At the present time, I am not sure whether I will be placing the original painting up for sale when it is finished or not. However, I will be making 8" x 10" photographic prints, limited edition 12" x 16" posters, and greeting cards of the completed image. If you would like to be notified by e-mail when reproductions are available, please leave a comment below or e-mail me. Names will be added to a wait list for the numbered limited edition posters on a first-come, first-serve basis. Thank you so much for your feedback and for the overwhelmingly positive response to my painting! Once again, I sincerely appreciate your support. Join Martycultural Art at the 2010 Moss Street Paint-In! Hi, everyone! I can't believe how quickly summer is passing-- we're already a week into July! I am delighted to let you know that I will be participating once again in the annual Moss Street Paint-In event. 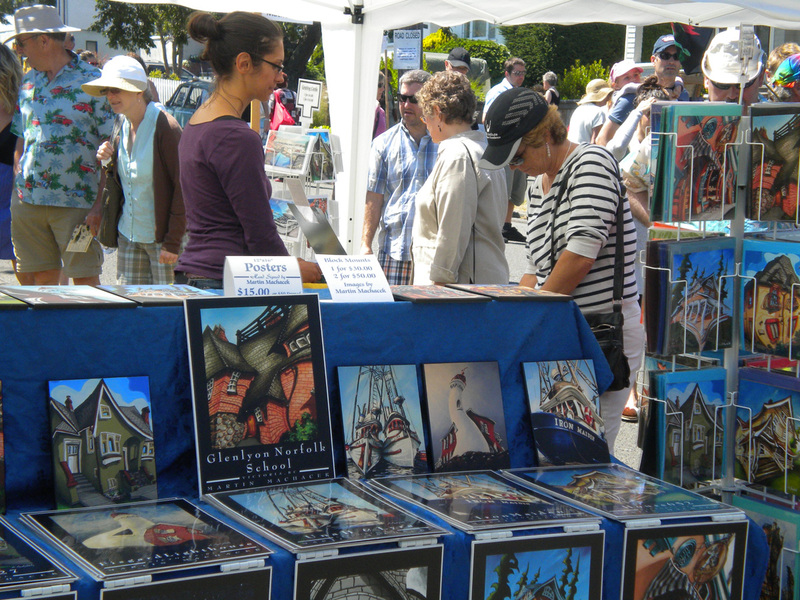 The Paint-In is Victoria's premiere local art event, with over 140 local artists taking to Moss Street, providing demonstrations, and selling their amazing artwork! My hope is to be working on a painting of the Craigdarroch Castle during this year's event. Let's cross our fingers for some more great weather, and I hope to see many of you out at the event!